Scott "Aztec" Tannian died in a car accident on June 10, 1999. I was his Big Brother when he and nine others brought new life to Iota Chapter, which was in danger of becoming inactive, in the spring of 1996. He became President and then Pledge Councilor of the Chapter, and was assuming the role of Alumni Liaison when his life was cut short. About 30 friends carrying candles gathered on the Gorham campus the following night, sharing thoughts, memories, and funny stories of Scott while passing around one of his prized possessions, a Native American peace pipe. He will be greatly missed. HAVERHILL, Mass.  Scott C. Tannian, 32, of Water Street died Friday at Lahey Clinic Hospital in Burlington, Mass., as a result of injuries sustained in an automobile accident Friday in Reading, Mass. He was born in Haverhill and attended Haverhill schools, graduating from Haverhill High School in 1984. He was completing his senior year in sociology at the University of Southern Maine in Gorham, Maine, where he was the founder and former president of Kappa Delta Phi. Mr. Tannian was extremely proud of his Penobscot Native American heritage. He will be missed by all who knew him, his family said. Surviving are his father and stepmother, Michael J. and Judith A. Kellermann Tannian of Bedford, NH; his mother, Betsy A. Nelson Tannian of Orono, Maine; two brothers, Michael J. Jr. of Haverhill and Ryan Tannian of Bedford; a sister, Mrs. Kevin (Kathleen M.) Verrier of Hampton, NH; paternal grandmother, Irene A. Norton Tannian of Haverhill; and maternal grandmother, Clara M. Nelson of Haverhill. Visiting hours will be from 6 to 9 p.m. Tuesday at C. Frank Linnehan and Son Funeral Home, 129 Kenoza Ave. A funeral Mass will be celebrated at 11 a.m. Wednesday at St. John the Baptist Church, 114 Lincoln Ave. Burial will follow in St. James Cemetery. For nearly five years, the University of Southern Maine was home to a student who broke down generation gaps, and touched the hearts of everyone he met. Scott Tannian, known throughout the campus as "Aztec", died in June from injuries received in a car accident in Reading, Massachusetts. He had been visiting friends from USM at the time. "There are still people who can't believe he's gone", said Chris Farwell, Gorham Student Life coordinator. Tannian was an older student who was able to see eye-to-eye with faculty, staff, and students alike. Living on campus let the 32-year-old sociology major stay in touch with the University that had become so much to him. "He was a non-traditional student who wanted people to look at him as being just a student", Farwell said. Farwell met Tannian in 1996 when both were participants of the first Anderson community living program. He described Tannian as a man of pride who stood up for what he believed in, but treated the opinions of others with respect. "He would always hear your side, and agree to disagree", said Farwell. Tannian was passionate and proud of his Penobscot Indian heritage, and especially cherished friendship. "You could not know him on Monday and be his best friend on Tuesday at lunch", said Andy Weeks, a Kappa Delta Phi fraternity brother. Tannian helped make the fraternity active again in the spring of 1996. "It started as just a bunch of guys hanging out together", said Tim Smith, Gorham recreational sports coordinator. The fraternity, which Tannian was president of for a time, was also responsible for his popular nickname. Rob Marrocco, a fellow brother, called him Aztec once while everyone was together. "The word 'Aztec' isn't really Indian", said Matthew McKenney, a fellow brother, of Tannian's Indian heritage, "but it exploded over campus like wildfire. He loved it. He gloated in it." Tannian always had time to talk to people, often missing class just to lend an ear and give a little advice. "He could have the exact same problem in his life, and yet he'd part the waters for people even though no one was around to do it for him", Weeks said. Tannian was very active in intramural sports as well, and helped organize a lot of teams. One of Tannian's favorite intramural sports was flag football. "He had a passion for football", said McKenney, who would spend a lot of time talking with Tannian about the sport. McKenney feels that he spent a lot of time with Tannian just talking. "I'd call him a chatter box. He always had something to say", he said. McKenney will have a hard time returning to the Gorham campus this semester. The campus, which was the primary stomping ground for Tannian, is full of too many memories. "Everything he touched he had influence in", he said. "He was one of those guys that everybody liked." McKenney remembers Tannian's wake. People from all over USM, including students, staff, faculty, friends, and family came to pay their respects. "Nine p.m. rolled around, and there was still a line down the road a quarter of a mile", McKenney said, "and it wasn't going anywhere fast." So many things can be said of Tannian, who came to USM in the fall of 1994. "I could write a novel on this guy", McKenney said. "He'll really be missed", Smith said. "USM was a better place with him around." USM will host a memorial to Tannian on the Gorham campus sometime in September. We sadly bid good-bye to Scott "Aztec" Tannian (Iota) who passed away in June from injuries that he received in a car accident in Reading, Massachusetts. He was returning home from visiting with some friends. Scott, a non-traditional student, who was extremely proud of his Penobscot Indian heritage, demonstrated his gregariousness at every opportunity. Some of you may remember seeing him at the Chapter Summer Workshops in 1997 and 1998. He thoroughly enjoyed the "ropes" course and was often observed cheering on the participants before and after he met the challenge. Aztec sought out the National Board Members making sure that they knew how well Iota Chapter was doing. He was a true leader. His efforts in helping to rekindle Iota Chapter in the Spring of 1996, as an undergraduate, were amazing and unquestionable. Ed Webber often remarked about Aztec's concern and dedication in this endeavor. He was President from April 10 to November 3, 1996. 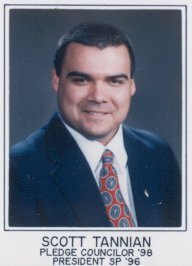 He also held the positions of Alumni Secretary, Pledge Counselor, and was elected as Alumni Chairman for the 1999-2000 year. His firm handshake, his convincing smile and his magnetic personality will certainly be missed. The one consolation is so many of us have a multitude of memories because we were privileged to know this inspiring Kappa Brother.